Sweet peppers and eggplant roasting on my gas burners. 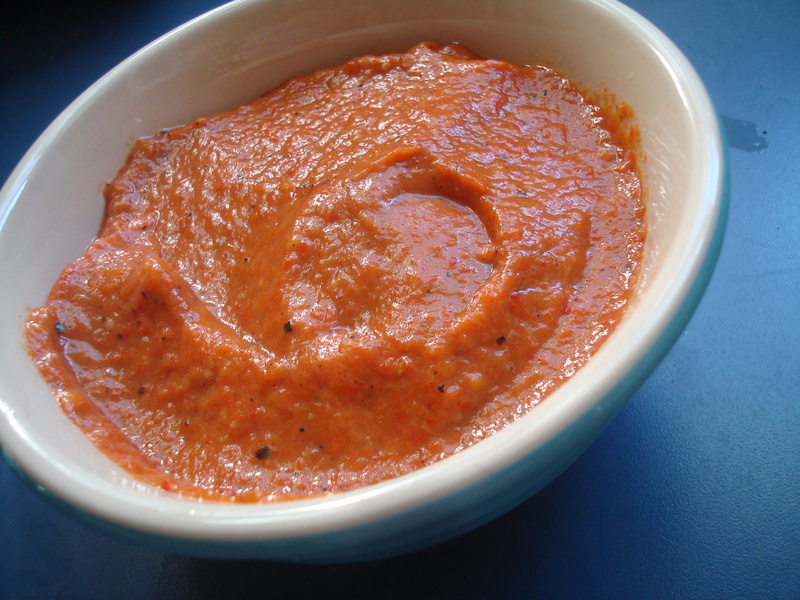 For weeks, I’ve been meaning to post this delicious recipe for tangy, smokey avjar, the Balkan roasted red pepper and eggplant dip that’s known as “Serbian salsa.” At least we still have some local peppers and eggplants at markets here, thanks to an unusually late summer harvest that was otherwise miserable for farmers. Avjar: The tangy, smokey finished product, all blended up. I first encountered the spread at Ziba’s Pitas, a favorite (and the only) Bosnian food cart in Southwest Portland. Unfortunately, apparently she uses the jarred version. Hey, at least Ziba makes her own dough for the flaky, stuffed pitas. Reading about Vanessa Barrington’s new D.I.Y. Delicious cookbook inspired me to make the dip (scroll down for the recipe). 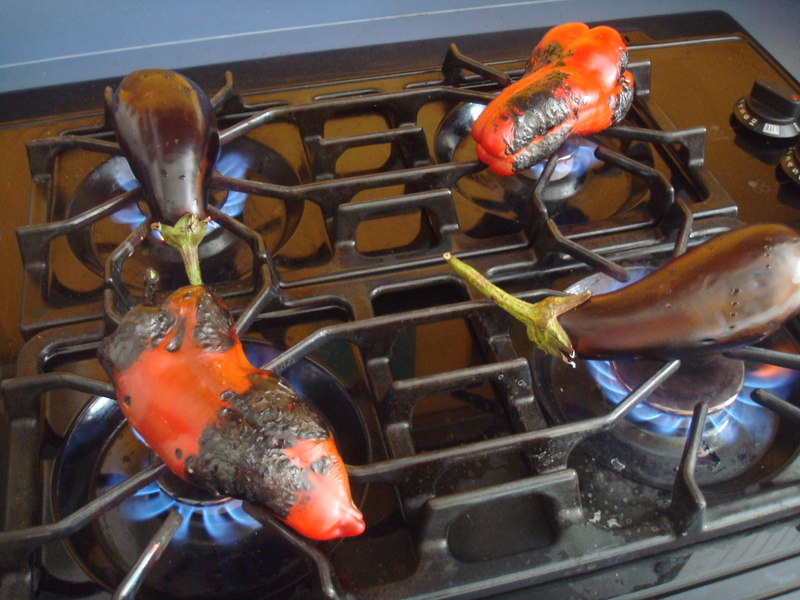 It’s easy to roast the peppers and eggplant on your stove-top if they are powered by gas. Of course, roasting does make a bit of a charred mess on the burners that your husband may complain about later. But avjar is worth it. Feel free to adjust the ratio of red pepper to eggplant in the recipe. I like mine more red peppery (sweeter) than I made it last time, and I see some recipes, like the Julia Mitric’s one for NPR, call for more peppers. And don’t worry about not having Aleppo pepper. I’m pleased with the results I’ve gotten using regular paprika. Then there are recommended ways to preserve avjar, like they do in the old country. But I’m not sure how the food safety behind this approach would check out. I decided to just freeze some (that hadn’t been cooked to death first) instead. Avjar is a great appetizer spread to put out, perhaps alongside some homemade hummus, when you have people over. I love it slathered on crusty French bread and topped with a crumble of goat cheese or feta for creamy contrast. I’ve also been known to eat it by the spoonful right out of the bowl. 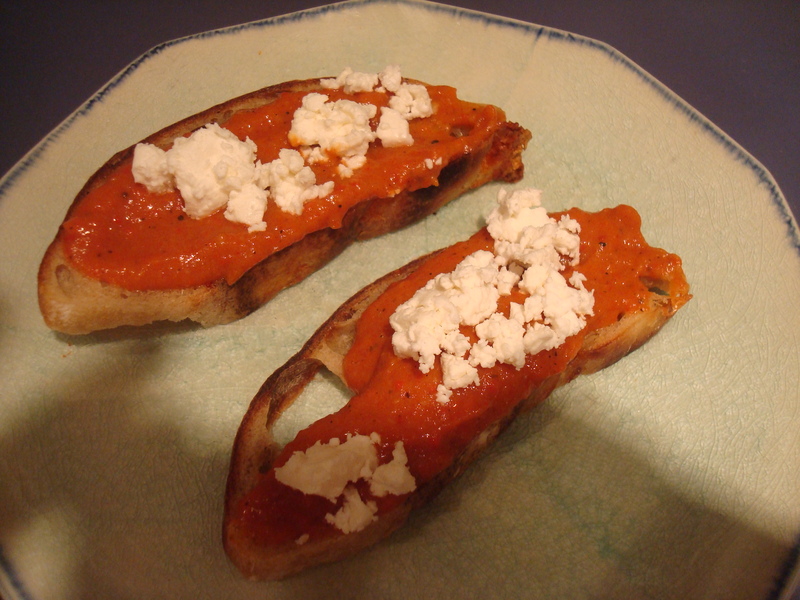 I like it served as brushetta, on toasted French bread, with a little crumbled feta on top. 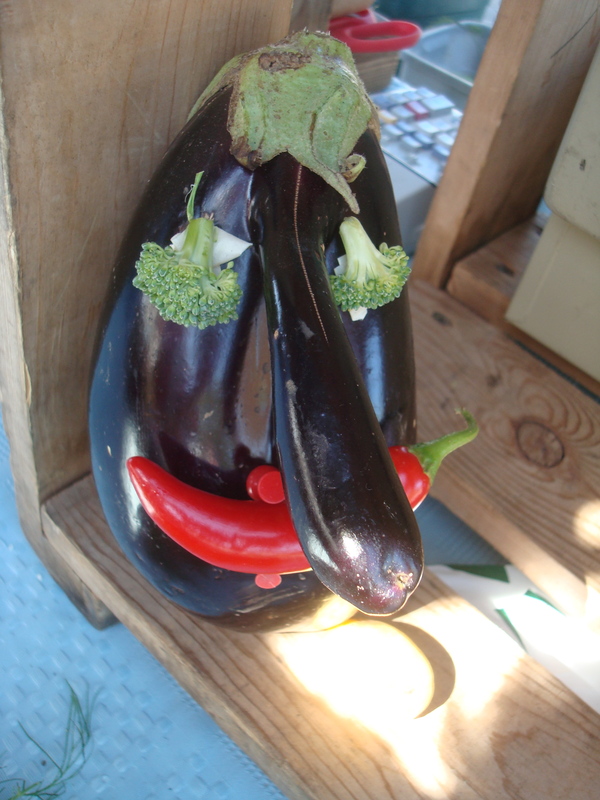 Thank you, Mrs. Eggplant Head! Yum, that looks delicious! I can’t wait to try it. Thanks for the tips.